Today we have an easy, but good topic. We’re sharing “Characteristics of God.” From loving to generous to selfless, this list can go on forever. Forever, or unending, another characteristic of God. 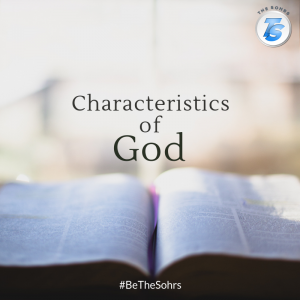 Our list is not complete without getting the characteristics you love about God. Why don’t you take just a second and share with us the attributes that come to your mind when you think of God. It’s your opportunity to share with your world and do what only, we, Christians, can do-BeTheSohrs. Let’s do it together; #BeTheSohrs! How Do You Share Jesus in the Workplace?